I live in Titirangi, and in recent weeks, I have watched Lopdell House emerge like a pale butterfly from its cocoon of scaffolding and plastic building wrap. It has undergone seismic strengthening and significant refurbishment, and work has now started on an adjoining new gallery. This locally important, grand building has had an interesting history and over the years has been used for a wide range of purposes. Built to try and capitalise on the established tourist trade in Titirangi and the Waitakere Ranges (primarily Auckland day trippers) ‘Hotel Titirangi’ was built in 1929-1930, and was promoted as “A Castle on the Fringe of Heaven” (‘Lopdell House and a History of Hotel Titirangi, by Peter Buffet (1986)). The ‘Spanish mission style’ hotel could accommodate over 60 guests in its fully-carpeted rooms with en-suites, and included a small shop, tea-room, restaurant with dance floor and an observation deck. However, the much hoped-for liquor-licence was never granted, resulting in the nickname ‘the Pub with No Beer’. 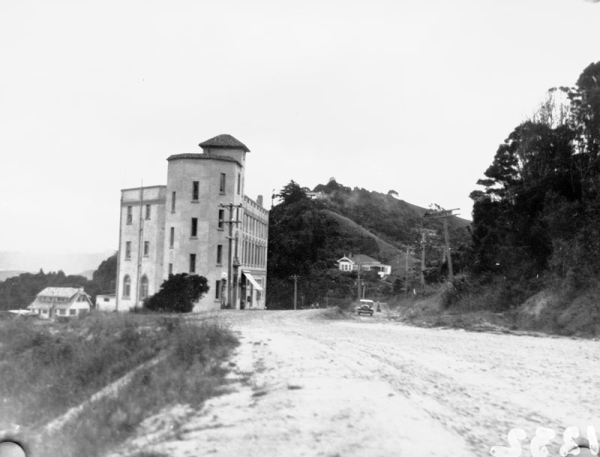 The photograph below was taken prior to the road from New Lynn to Titirangi being concreted in 1931, and also prior to the ‘Hotel Titirangi’ signage being added to the building. During the 1930s the hotel struggled to attract staying guests, with most of its revenue being earned through the restaurant and tea-room. A night club was added towards the end of the decade but the lack of a liquor licence continued to limit trade. The start of World War II added to its challenges and the hotel was sold in 1942 to the Department of Education for use as a residential School for the Deaf. The aerial photograph below shows the imposing scale of the building in its surrounding landscape. The School for the Deaf served all deaf school-aged children born north of New Plymouth and Gisborne. Rolls fluctuated but at one time reached a peak of 80, requiring ex-army prefab buildings to be located nearby to be used as additional dormitories and classrooms. When the school transferred to purpose-built premises in Glen Eden in 1960, the building was renamed ‘Frank Lopdell House’ after the Superintendent of Education. For the next 22 years it offered residential training to in-service teachers from all over New Zealand. Purchased by the Waitemata City Council in 1983, the landmark building was refurbished as an arts and cultural centre, with studios, gallery spaces and a 100 seat theatre. Auckland Council partnered with the Lopdell House Development Trust (formed in 2002) on the current redevelopment, and Lopdell House Gallery it is set to continue as a significant arts hub for West Auckland. Newspaper articles and other items can also be located via the New Zealand Card Index (1950s - 1996) and Index Auckland (1996 onwards) keyword search: Hotel Titirangi and Lopdell House. Thanks for this really interesting history! Wonderful photos too. So pleased the history has been recorded - I remember being told my Aunt and Uncle spent their honeymoon at the hotel. As my uncle's mother and father had owned a 'batch' at Jenkins Bay I found this quite unusual, but realised they must have loved Titirangi. My Grandparents eventually built retirement home in Titirangi. I remember as a child my Grandfather taking me for a walk to Titirangi past Lopdell House when it was the school for the deaf and you could hear the children at playtime laughing but with no real words as education was then. To see it now is a real joy to me. Its been great to read the comments posted. Unfortunately I haven't been able to find an answer from published sources. Obviously all the early photos are black and white, and when they switch to colour the salmon pink is in place. 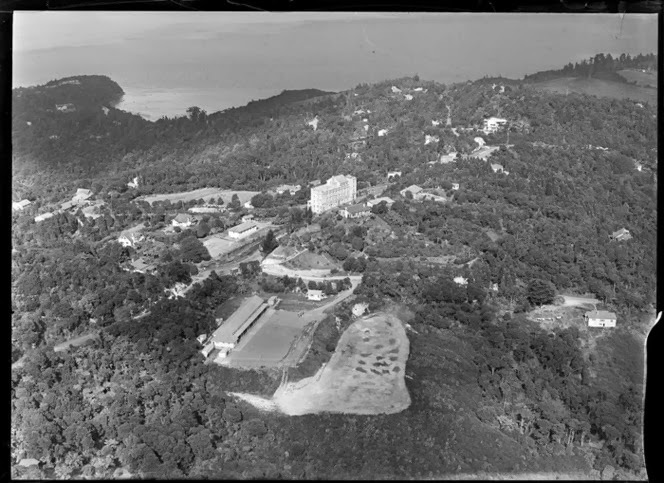 In Marc Bonny's Titirangi ‘Fringe of Heaven’ book (referenced above), he refers to it in the 1950s as being "really grey and dirty in those days", which would have been largely due to the fact that South Titirangi Road was unsealed, potholed and described as a "gravelly grind" (p221). 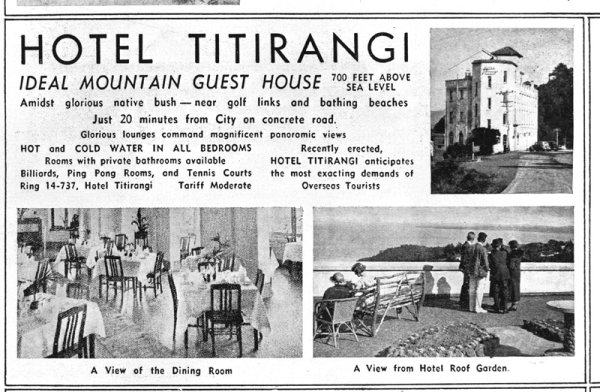 Papers Past http://paperspast.natlib.govt.nz/cgi-bin/paperspast has advertisements for buying shares in the construction of Hotel Titirangi, plus articles covering its opening and subsequent liquidation etc. Whilst the items wax lyrical about its amenities and attractions, none of them refer to its colour. However, in a recent edition of the local monthly publication The Fringe (formerly the Titirangi Tatler – Issue 124, February 2014), local arts consultant Naomi McClearly stated that Lopdell House had been “returned to its original Spanish White” as part of the restoration. If anyone has anything to add on the colour issue, do please post! I have been able to track down some additional information on the issue of which colour Lopdell House was originally painted. 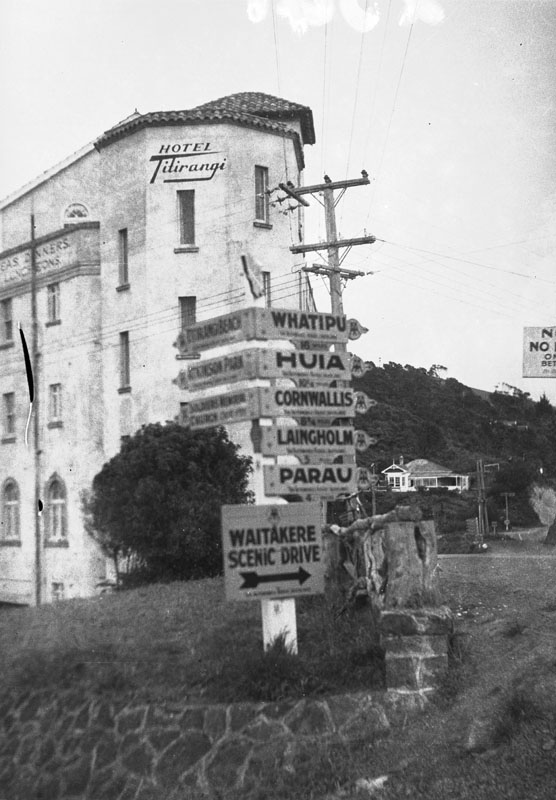 "High and conspicuous on a spur of the Waitakere ranges, white against the background of green bush, stands the Hotel Titirangi. From almost anywhere on the Manukau Harbour it takes the eye, for it has a glorious view over land and water.” (Titirangi Hotel and its Tale of Tribulation, John Mowbray, The New Zealand Observer, 8 July, 1939, p9). “This early description of the hotel suggests that it was painted white. A beacon from afar, the building asserted its landmark prominence by being painted to contrast with the dark bush clad hillsides of Titirangi. Such a description also fits with other hotels of the time - resort style buildings that were built near beaches to attract tourists and day visitors. (Conservation Plan - Lopdell House & Precinct, including Lopdell Hall, October 2008. Archifact Architecture & Conservation Ltd, p50). The Conservation Plan also includes some photographs from 1983 and 1989 showing Lopdell House painted khaki green with what looks like a light green trim, confirming the childhood recollections of the Titirangi local who asked me about the paint colour. Unlike the khaki green and then the salmon pink, the choice of white paint is much more likely to be welcomed by locals and others, as well as having the strength of at least some historical evidence to suggest it was the original colour. 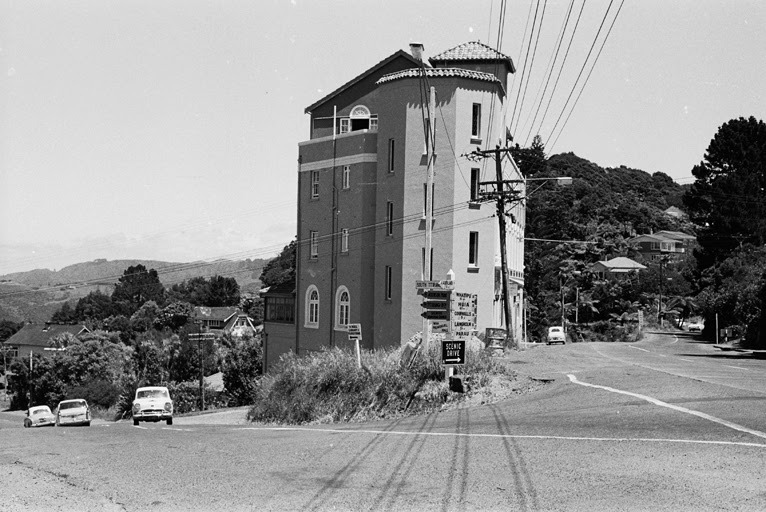 In the mid 60's (when we moved there) the corner ground floor of the building was used as the Titirangi Post office, much of the mail was collected from mail boxes...we wondered why we didn't receive any mail for weeks, on checking they had a big stack "waiting" for us to collect! I have stumbled on this site by chance but so glad I did. Brings back memories of Titirangi, My mum worked in Lopdell House when it was the School for the Deaf. She used to help with the lunches for all the children. Thanks for your comment. We have looked at the photograph and believe it is the right way round. Though aerial photographs can be looked at from all different angles and still be the correct way round. Looking for an unusual career?